This breathtakingly beautiful Cabo San Lucas Hotel sprawls over eight acres of exclusive private beach at the southernmost tip of Mexico’s Baja California Sur peninsula. Close and within view of this lavish resort, are many Los Cabos landmarks and highlights, including Land’s End, the famous natural arch pounded by waves off the Pacific, and glorious Pacific sunsets. Spend your day relaxing at the resort’s poolside bar, spa and outdoor jacuzzis. Or, if it’s shopping, fine dining, local hangouts, or nightlife you’re seeking, downtown Cabo San Lucas is just a short stroll away. 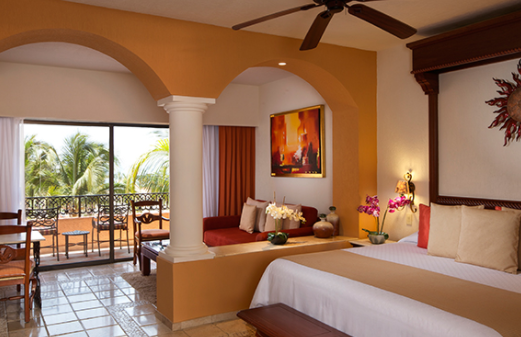 All Playa Grande Resort accommodations feature suites with private balconies, kitchens or kitchenettes, and distinctive design qualities such as marble floors, granite countertops, hand crafted furniture, and authentic Mexican decor. Playa Grande Resort provides an exceptional value perfect for families, couples and other travellers looking for quality on a budget. In the heart of Cabo San Lucas, Playa Grande’s location is also fantastic. You can venture out to explore, and find vibrant Mexican artifacts, a great variety of restaurants and clubs, and experience the Cabo vibe. 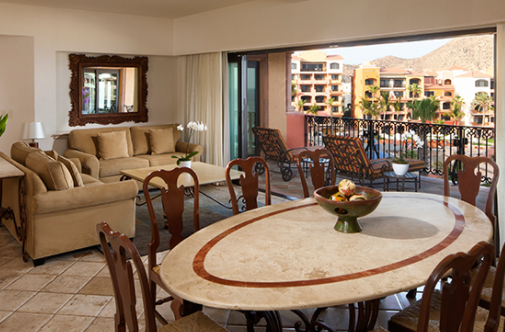 Or, you can easily break away to relax in your suite or poolside. Room rates include accommodations only (European Plan), but delicious meal plans are available on request. With five restaurants and plenty of bars onsite, Playa Grande Resort will unquestionably fulfill your culinary tastes. This great location is also only a short walking distance to other amazing restaurants in downtown Cabo. Just ask your LuxLife Concierge for restaurants which fit your style, cravings, and budget best. THE FRILLS – Who said you can’t have quality on a budget? The FRILL STYLE is where you receive all the frills without breaking the bank. No compromise on quality or experience, just great value, meeting both expectations and your budget constraints. You have access to a spectacular white sand beach with amazing Pacific sunsets, but you must be advised that it is not a swimmable beach. This is for everyone’s safety as the currents and undertow are unpredictable and can be strong. This factor should not detract from your enjoyment, as there are an assortment of fabulous infinity-edge pools overlooking the Pacific, and plenty of other water activities. Deluxe Junior Suite Studio has one king bed, kitchenette, queen size sofa sleeper, full bath with tub, private balcony with sweeping views of the Sea of Cortez and the Pacific Ocean, coffee maker, direct dial phone and parking. 633.02 Square feet. Luxury Ocean View Suite is a large one bedroom suite with one king bed, two full marble baths, queen size sofa sleeper, Murphy bed in living room, closet safe, private balcony with striking views of the pacific ocean, air conditioning, iron and ironing board, satellite TV, direct dial phone, modern kitchen with all necessary utensils. 850.02 Square feet. Two bedroom Presidential with well equipped kitchen with electric stove, microwave, Refrigerator, blender, toaster and coffee maker. Dining room, living room, and 3 bathrooms. Bathroom main room with Jacuzzi, main room king size bed, guests room with 2 twin beds, a twin Murphy bed. Safety box, iron, iron board, hair drier in each bathroom, radio-alarm clock, terrace in dining room, balconies in rooms. 1553.23 square feet. Located at the very tip of Baja California Sur, Playa Grande’s resort campus sprawls over an area of 8 prime acres surrounded by the Pacific Ocean to the west, and the Cabo San Lucas Marina and Sea of Cortez to the east. 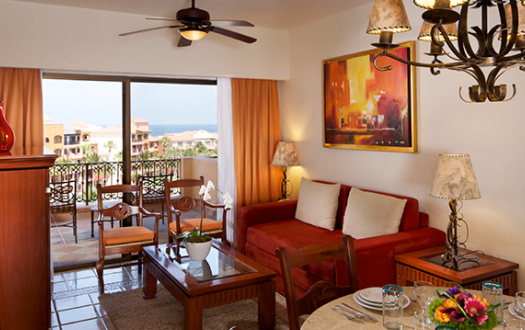 All villa suites have private terraces with breathtaking Pacific views, while the property is close enough to enjoy all that the town of Cabo San Lucas and the famed Puerto Paraiso Mall have to offer. Playa Grande offers three onsite restaurants for their guests’ enjoyment. Another six restaurants in the Solmar Group are available. Please enquire. Guests may be pampered from head to toe, with seawater baths and seaweed based treatments from the Sea of Cortez; tailored to their exact needs at Playa Grande’s Spa by Solmar, as well as Sea Spa Cabanas on the beach, or in the privacy of your room. Individual or couple treatments range from hot stone and body scrubs to Reflexology, Body wraps, Ayurvedic treatments and Aromatherapy sessions and more. “All registered guests are welcome at Playa Grande Resort & Spa. Children and infants are readily accommodated, with a playground on site. Children under 12 stay for free in their parents’ room. Extra person, in room child care, and crib charges will apply. Pets are not allowed. Non-registered guests are not allowed in guest rooms. Airport shuttle is available $42 USD roundtrip fee applies. Late check out available at extra charge. Free self and valet parking. Wifi in rooms at $13USD per day, available also in some public areas at extra charge. Playa Grande is an European Plan resort. An all inclusive meal and drink plan can be added to your vacation experience for an additional fee. Please ask your Lux Life Vacation Concierge for packages and pricing. All rates listed are in U.S. Dollars. We understand that unanticipated events happen occasionally in everyone’s life. Business meetings, project deadlines, car problems, snowstorms, and illness are just a few reasons why one might consider cancelling their vacation. In our desire to be effective and fair to all and out of consideration for our guests’ time, LuxLife Vacations provides a FREE CANCELLATION POLICY until the standard resort policy is in effect. We do abide and honor the same cancellation policy that the resort sets forth. Please see below for Your Resort’s Standard Cancellation Policy. Your senses are in for a treat: It’s all about Sea, sun, sky & sand.